I was lucky enough during the first weekend of October to visit the world famous Oktoberfest in Munich! The trip was organised by my Rotary District for just a select few exchange students and took place over the German Reunification long weekend. I met with 20 Rotary Youth Exchange students at 6am in southern Hamburg, half asleep but ready to begin the 8 hour long journey to Bavaria. We split up into 3 cars driven by Rotarians who had volunteered to be our chaperones for the weekend. The long car journey was quite uneventful, but we did have a terrific view of some absolutely stunning scenery, which was a a different to what we’re used to in Northern Germany, due to the mountainous landscape. We arrived in Munich the same afternoon, and continued driving until we reached our destination in the outskirts of the city. Upon sighting our hostel, it was revealed that we would be sleeping in an old castle overnight. As we were all exhausted from the long day of travel, the evening ahead was relatively relaxed. We played together a German version of ten pin bowls and in typical exchange student spirits, concluded the evening with dancing. 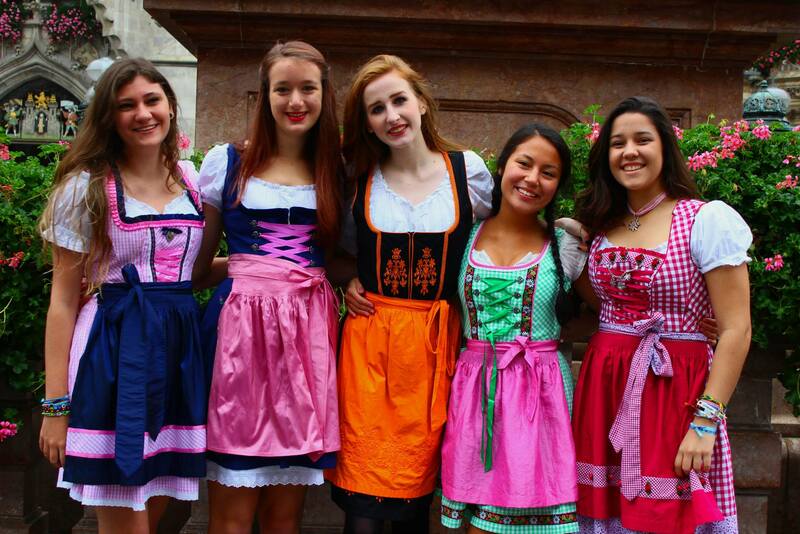 Our much anticipated visit to Oktoberfest in Munich took place on the Saturday, a group of four girls and I immediately dressed in our Dirndls before heading down to breakfast. I had already bought mine during my first visit to Munich. A Dirndl is a traditional Bavarian costume, and very popular dress to wear to the Oktoberfest. Lederhosen are the male counterpart. 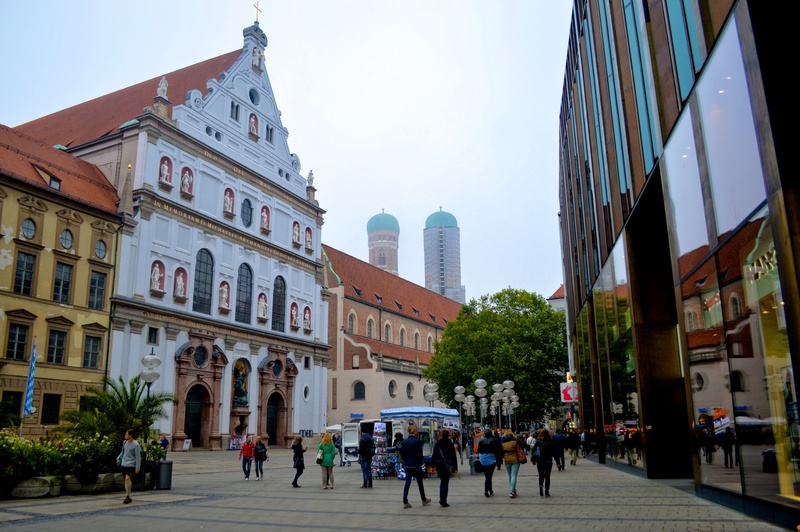 We first made our way into the center of Munich and began a small tour of the city, including the Rathaus and Marienplatz, the main shopping street, The Frauen Kirche and Asam Church. 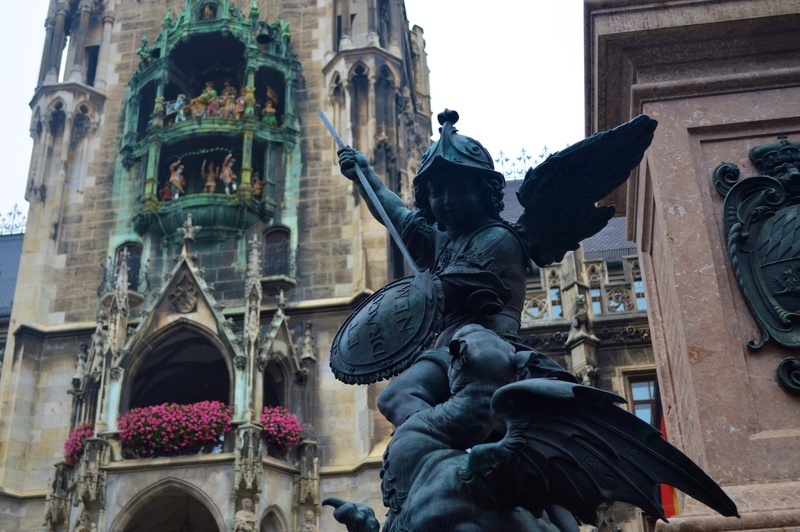 I was lucky enough to be visiting Munich for the second time (my first was with my second host family in July), and to have already seen many of these attractions. Nevertheless, the city’s historic architecture will never fail to amaze me. One can definitely notice a stark contrast between Germay’s north and south. Everyone was given an hour of free time to explore for themselves, many used the time to buy either a dirndl or lederhosen. We met up again at Marienplatz, where the town hall is located and were treated to a puppet show as the clock struck 11am. Inside the town hall’s central tower are figures which dance as the clock strikes on the hour, and crowds of people gather in the main square to watch. Soon enough it was time to catch the S-Bahn to Oktoberfest! Oktoberfest is held at a very large showground, and the festival stretches as far as the eyes can see. The main attractions are the gigantic beer tents owned by various German beer breweries. During the weekend, the tents were all overflowing and one may have to wait hours until being let inside. Otherwise, the remaining area is covered with countless rides and food stands. The group had a reservation in one of the tents, otherwise we wouldn’t have been allowed inside. The atmosphere inside a beer tent is incredible and also very difficult to describe. I believe it’s a unique experience that one would have to encounter firsthand. Of course, it’s extremely loud inside. A band is playing traditional Bavarian songs on a stage in the centre and hundreds of tables and banks full of thousands of people sitting, standing, and singing their lungs out. The highlight of my time spent inside the tent was when my friend Lauren and I simply paraded up and down the isles with our camera and took photos of the many happy and enthusiastic people. It was a great way to engage with people and many requested that we take photos of them, we ended up with some fantastic shots capturing the Oktoberfest spirit. It was time to head back north on the final day of the long weekend, but before we officially hit the road we were taken to Allianz Arena, the second largest soccer stadium in Germany and home of the team FC Bayen München. We were taken on an English Guided tour of the stadium and saw everything from the pitch, to the dressing rooms. I must say that I’m not such a huge fan of the game, but soccer is extremely important here in Germany and one could probably say that it’s the national sport. 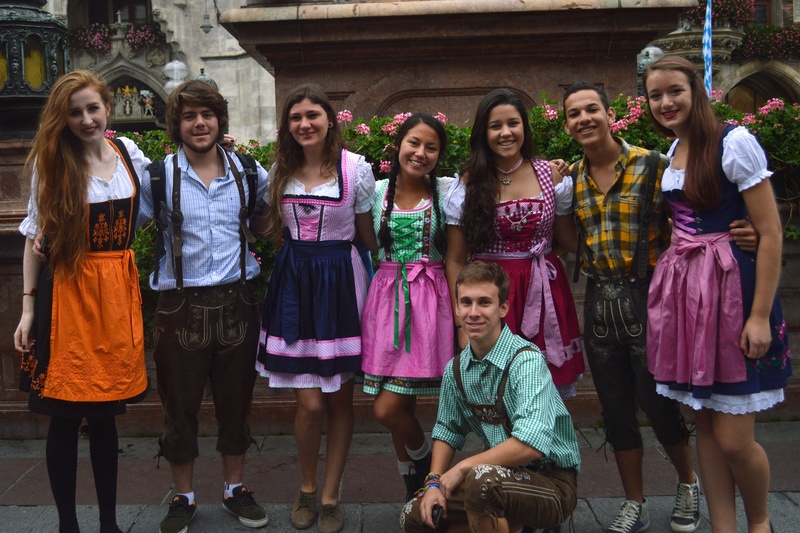 Visiting Oktoberfest was heaps of fun and will always continue to be a big highlight of my exchange year. I’m pleased to have experienced such a well known aspect of German culture and to have had the opportunity to see Munich once more.